The school was founded in 1998 by a group of Christian laity and is accompanied by the Schoenstatt Fathers. 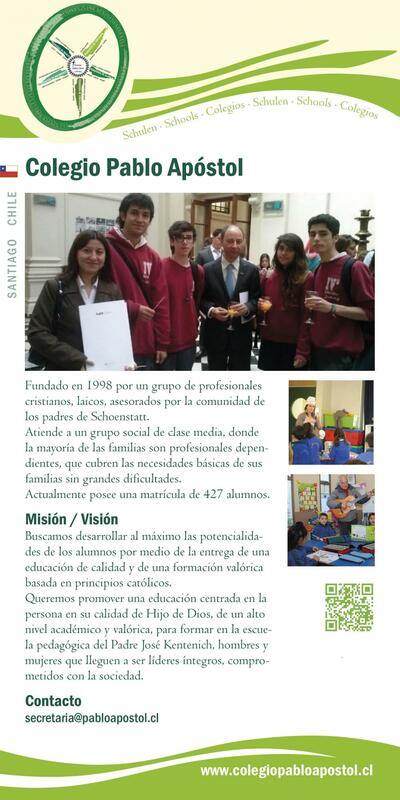 The catchment area of the school is a middle class suburb of Santiago. At present the school has 427 students. It is composed of a pre-school, primary school and middle school. To develop the potential of the students to the highest degree possible through a solid education and training in Catholic values. To provide a high academic niveau that is orientated to values, in order to educate men and women in the spirit of Fr Ken- tenich‘s pedagogy, so that they are able to take on responsibili- ty for society as all-round leaders.